Aquamira Frontier Pro Ultralight water filter has all the benefits of a larger bottle filter in a compact size. Straw style filter attaches directly to water bottles or bladders (28mm thread adapter). "Porous Plastic" filter with Miraguard technology. Attached cap keeps mouthpiece clean. Pre-filter lengthens filter life. Remove bite valve to use as hanging drip filter. Tube adapter draw tube included. 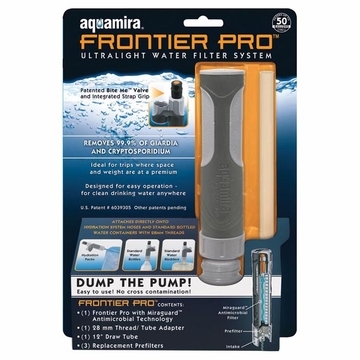 Filters up to 50 gallons.